Imagine something like this, but more in the style of an Anchorage politician visiting Fairbanks. On the Saturday after the filing deadline closed and Mark Begich turned Alaska’s gubernatorial race on its head by announcing he would run on the Alaska Democratic Party’s ticket, the former former U.S. senator stopped by Fairbanks for a whirlwind afternoon tour. About 20 minutes of that included sitting down in a coffee shop with your humble editor of The Midnight Sun. What followed on my end was a comedy of technical errors–including forgetting to get a picture–that has delayed posting that interview until today. If you’re a candidate running for office or their campaign manager and want to set up an interview with the Midnight Sun, contact me at matt@midnightsunak.com. TMS:So why’d you decide to get into the race? Begich: “First off, I have thought about this the last few months and gone back and forth trying to figure out what’s the right decision. Deborah, our son, Jacob, and I and a group of friends sat and talked about it a lot on Tuesday (before the filing deadline) and realized this isn’t about us and what’s good for us, but it became very clear to me that I can’t continue to stand by and watch our state slowly deteriorate and be at the level it’s at when I know we can do better. TMS: The reaction to your entry has been mixed. What would you say to the people who say you’re handing the race over to Republican front runner Mike Dunleavy? Begich: “First, I’d say we don’t know if Dunleavy is going to be in there. Mead Treadwell, who’s another former Juneau person as the lieutenant governor, is also in the race. I understand he’s going to have a super PAC supporting him, so there’s going to be a lot activity over there. I don’t know if Dunleavy is going to be there or not, but that’s not really what it’s about. TMS: It seems as long as there’s been a governor’s race on the radar, there’s been rumors that you’d get in. How did that decision unfold for you? Begich: “People who know me, know I take the time to think about these things and engage people in the conversation. When I ran for mayor and won, it was two days before the filing deadline. When I ran for the U.S. Senate in 2008, it was the same year as the election. It was late April and the election primary was August. This one, again I’m not someone who’s just going to jump in because I need some ego fix, if I’m going to do this because I believe that I can set aside what I’m doing in our lives and there’s something that I can do and offer to the state. When the elections occur in November, the voters will make this call. Did I present them with an alternative that they feel good about? That they want to vote for? I have to leave it up to the voters to make this decision, but decisions like this are not easy. They take a lot of thought, and I just felt like–especially after this last session–they don’t have a long-term fix on the budget, crime is at the highest level it’s ever been in the state and we have thousands–3-4,000–people that have left the state. TMS: There’s been plenty of talk about a progressive “Blue Wave.” Do you think that’ll be at play with your race? Begich: “Some call it a blue wave, I call it the positive wave. People are fed up with this negative, naysaying, knuckle-dragging attitude about what’s not possible. People want something new and fresh that they can say, ‘I want to be for something’ and look beyond the moment and beyond the day-to-day street fights that are going around and figure out what we’re going to do in the long-term. TMS: After the 2014 election, you went on to form the Northern Compass Group. What have you been up to with that new venture? Begich: “I’ve always been in business, since the age of 14. Northern Compass Group was a new venture. We do business and public policy together. We don’t lobby. We work on tough projects. People come to us with challenges they’ve had, and we use our expertise and my ability to grab and look for innovative ways to approach things. An example of this is we were very active and instrumental in the latest issue in Anchorage, which was the Municipal Light & Power and Chugach merger. That had been tried for 40 years, even when I was mayor we couldn’t get it done. … When I was approached about this, I said what can we do here and we won that with the ballot that was 65 percent of the vote. That is an amazing thing in these times because we gave them the positive attributes of what that would mean for them as individuals. That was a great project. TMS: Some of the people who’ve been critical about your entry into the race have pointed to your connection to the oil industry. Can you explain those connections and how would they affect your response to climate change? Begich: “We can’t close our eyes to the fact they are part of the economic driver to the state, but we should not always have them as the only driver. I would say this: When we talked about oil and gas exploration in the north, we worked with the whaling captains, the community, the environmental community about what’s the right way? When we talked about NRP-A, we talked about protecting the lake there and making sure the right kind of balance is there. When the oil industry had on their docket they wanted to drill in Bristol Bay, I said no. When the mining industry and Pebble Mine wanted to move forward, I said wrong mine, wrong place as Sen. Stevens said. I agreed with him on that point, and oddly enough so does the Trump administration–that’s a trifecta: Begich, the late Ted Stevens and Trump. I’m also a huge, huge believer in climate change and what we need to do. I think the state has failed to figure out how to move forward. I know the governor has just announced a climate change task force that’s maybe the third one we’ve had now. Just take the recommendations he got from his transition team and let’s move forward, but that seems to be a problem and a challenge. I’d say there’s no one better who understands the environment we live in than someone who is born and raised here and is raising their kid here, and understands the precious value of that. TMS: Your chosen running mate is a woman (Debra Call), your campaign manager is a woman and so is your spokeswoman for the campaign. Can you talk about the importance of having a diverse campaign? Begich: Women have been an important part of my professional and political work. That’s just who I am. My father died when I was 10, my mother raised us six kids as a single parent, a very strong woman. She taught me a lot about a variety of things, but I also saw this incredible woman that took on incredible challenges. My campaigns, my businesses have always been women-dominated in the sense of working there, but have also been very diverse. … I’ve always operated in this world believing that no one’s excluded from the table, everyone’s at the table. When you talk about issues like education, economic development, small business development and crime, these are not a certain segment of the community, it’s everybody. TMS: In your announcement, you talked about solving the “actual problems” facing Alaska. What are those? 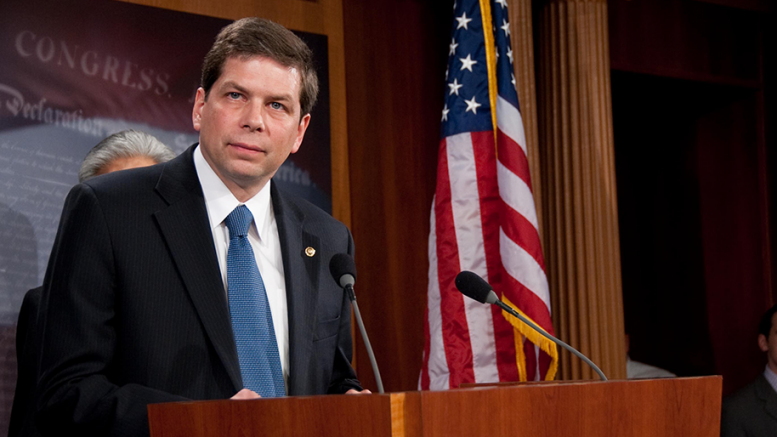 Begich: “We’ve got to regain the faith of the people of the state. When 65 percent don’t believe we’re moving in the right direction, we have to resolve that problem because then you can’t do big and bold things to move the state to the next level, where we should be. I think the permanent fund dividend should be in the constitution with 50 percent going to the permanent fund dividend with 10 percent going to inflation proofing and 40 percent going to education. The infrastructure is crumbling, for some reason they politically can’t put a bond on the table–I’d like to look at a five-year bond, put that on the table. Let’s get a long-term plan of how we engage the community on supporting our deteriorating infrastructure. This can’t be a Christmas tree, either, this would not be for legislators to just add their pet projects. They have to be vetted, come from the community and a value to creating safe or growing economic conditions. 2 Comments on "Begich sees himself as alternative in race for Alaska governor: Interview"
So grateful you made the correct decision Mark. I’ll be helping you for sure.